Knitting and crocheting can provide tremendous health benefits, both mentally and physically, not to mention great pleasure as well. In fact, they have been shown to preserve and even improve cognitive and physical abilities as we age (see Knit and Crochet Benefits and Tips for Seniors), as well as help people heal from a myriad of conditions including depression, PTSD, schizophrenia, chronic pain conditions and more (Crochet Saved My Life, 2012). But along with all the benefits crochet and knitting provide, we still need to be aware of some knit and crochet Health Concerns and the wear and tear it can wreak on our bodies. And perhaps even try a specially designed ergonomic hook to limit hand tension as you crochet, or you can even make one with polymer clay like I did here. Of those listed below, I have only tried — and can personally vouch for the comfort of — the Addi Swing hooks, but I wanted to give you a selection of what is available. Even with good positioning it is important to stretch and move around at the first sign of stiffness or tightness. To stretch and relieve tension in your neck, tilt your head back and then side to side. Try rolling your shoulders a few time to loosen them and your upper back. Make it a point to get up and do something else every half hour or hour or so. Most importantly, be sure you are working under good lighting. You don’t want to be squinting at those stitches or your pattern! If lighting is a problem, Desk Lamp can help direct light where needed. And just like when you are looking at your computer or tablet too long, keeping your eyes focused on your project for too long can lead to eye strain and even headaches. Again, frequent breaks can help. Be sure to change your focus every 20 minutes or so to something more distant … look out the window, at the TV, focus on a figurine you have in the corner. Another handy tip for reducing eye strain is photocopying your pattern at over 100% or you can use a magnifying stand or around-the-neck magnifier. I love to just sit and crochet or knit and listen to my books on tape. I can do it for hours lost in my own little blissful world. But let’s face it, crocheting and knitting are very sedentary hobbies, and too much sitting can lead to “crocheter’s toosh” as I playfully call it. Sitting too long even zaps energy from you. With my mother’s advice passed along in my head — “energy begets energy” — I remind myself to keep moving. Exercise is important for everyone, but especially for those of us who enjoy hobbies that aren’t very active. Try to aim for 20 to 30 minutes of brisk exercise every day, whether it be a walk around the block or a stationary bike at the gym. Get up and get that blood pumping! And be sure to drink a lot of water to stay hydrated and keep those cravings at bay. In addition to these tip, older adults often have additional concerns and challenges. You can read more about the specific needs of seniors in my article Knit and Crochet Benefits and Tips for Seniors. 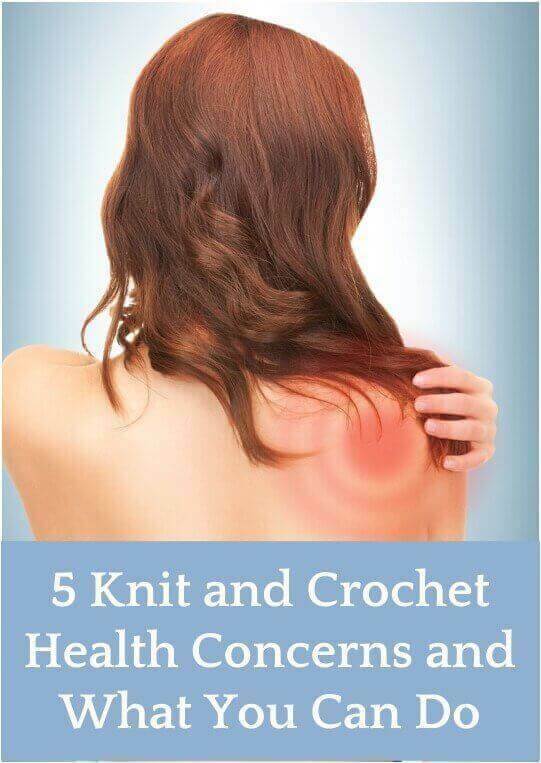 Hopefully with awareness about these knit and crochet health concerns and the simple tips suggested you will be able to keep your body healthy and strong to enjoy many, many years of knitting and crocheting ahead! Do you have any health tips to share? Feel free to comment below and share how you stay healthy. Thank you very much for sharing me such good info about health. Can you suggest me back pain exercises because there are several pain in my backbone? I am tired of medicine and want to do exercises. If you have any idea please suggest me. Very useful and informative. I’ll be sure to act upon them. That sitting posture is an important one! I have found that it is also quite helpful to work over my computer desk so I have room to spread out my project and rest my elbows if I need to. Of course, this also gives me the opportunity to stream TV episodes or movies – I have to pay attention to what I doing with the pattern or I will end up making a mistake. I both knit and crochet; I don’t really have a strong preference for either, although I have noticed that some things come out better if they are done one way. I just got myself a Boye ergonomic crochet hook handle – it comes with different size rubber washers for each size metal hook . It reminds me of a Playskool toy, but it does help prevent wrist pain, especially with the smaller hooks. I learned knitting from2014 and feel very happy to it.I wish ladies again keep buzzy their self in knitting. I found that switching from straight knitting needles to circular needles, even if not knitting In the round is helpful for the hands and wrists. Circulars keep your project in your lap instead of on the length of straight needles causing the weight of your project to put strain on your wrists. That should be soft touch hooks by the clover company. I crochet and it has helped me to loose weight by keeping me busy and relieving stress . I am a stress eater. I use sift touch hooks they are much easier on my wrists then the plain metal ones. I love the sift touch hooks. Thanks for the post it really helps! Started on knitting and crochet by my great-grandma when I was 7, had to give it up for a while due to CTS caused by years of office keyboarding. Finally able to pick it back up again without my wrists/hands aching immediately. Here’s a couple of home therapy tips I got from my orthopedic specialist & the therapists. Run these ideas by your doctor first. 1) avoid “heating/icing” creams like BenGay or IcyHot, all they really do is create a chemical sensation at the skin level which does feel good but doesn’t do much else. Instead, use an anti-inflammatory cream such as Myoflex or Aspercreme (make sure you’re not allergic to aspirin first.) They also aren’t as pungent smelling, and can be used safely with a heating pad. On the upside, I crochet to relieve my mild arthritis – engaging my fingers is actually therapy! However, the tips provided are very valid. I’m thinking about getting a stationary bike to exercise while crocheting! I’ve developed a small tear in my rotator cuff, and it is directly related to crocheting. Excellent article, thanks. People take note of what the article says!!! I have just had my second carpal tunnel surgery. Both worked well but are really pretty horrific and can be prevented by a few hand stretches and listening when your body says I’ve had enough of this. I was told I would never use my hands again at one point which would mean no more drawing crochet cooking gardening and all the things that make me happy. It was the worst thing I had ever had to consider. Hands are too precious to damage! I enjoyed reading the article and found that I already do some of these exercises. The problem I have is that I don’t hold my hook the same way as it seems everyone else does. And I have taught my daughters to hold it the same way as I do. I learned a basic double crochet from a neighbor 27 years ago and the rest from books. I hold my hook not like a pencil, but more like a toddler would hold a spoon before being taught the correct way…lol…kind of like a little shovel. I can crochet fast and tight this way too. I have had several years off and on when I could not crochet at all…leaving me very unhappy and at times tearful!!! I am going to try the Amor Crochet hook set to see if it does help with fatigue. Does anyone else hold thier hook ‘wrong’? I taught myself from a book and hold my wool as you would in right hand for knitting and use right index finger to put woh. Tried the other way but tension gets extremely tight. I crochet exactly the same way and actually made my hand problems better doing it this way. If you want to try a different position buy some writing grips to help teach pencil control. My occupational therapist said if I could use different positions and grips to crochet with it would even out the muscle strain a little. You are using the “overhand” method to hold your hook which is not “wrong”. There are two major ways people hold their hook and this is one of them. However there are minor differences for each person because of personal preference. For example, I hold mine in the underhand or pencil way but I also extend my little finger to support my hook. Calling the underhand method the pencil way isn’t correct either. My brother-in-law grips his pencil between his two fingers instead of between his thumb and finger. I read in a beading book to always have a glass of water next to you during these long hours of crafting:) then you will be getting up and going to the bathroom and stretching your legs to prevent blood clots. Thanks for the tips, I have heard that using the old fashion metal needles does not help as they have no flexabilty in them plastic are best. I never thought about the effects that our hobbies have on our health. I think these tips would be great for a lot of different hobbies! Thanks for sharing Kara. Years ago I taught a friend to crochet, and she gave up smoking as a result! She couldn’t smoke while both hands were occupied. So there are good things that happen when you take up a craft! I like to walk in place, or crochet on my exercise bike. Obviously not when dealing with a difficult pattern ;). I have carpel tunnel and arthritis flares, but emu oil usually has me back crocheting within the day. Blue Emu from Walmart is great (by the Icy Hot). Thanks for sharing the link to Crochet Saved My Life and to my article on hand exercises for crocheters. And thanks even more for sharing this terrific, comprehensive, important info for knitters and crocheters. Great article. Great article!! I recently found out I have carpal tunnel syndrome and right now I can’t crochet at all (per the dr.). If I do keep on crocheting the pain, etc. will get worse. I have a wrist splint I wear at night and am going to pursue the exercises your article suggested. It’s not fun!! I really enjoy crocheting and I make baby items for various organizations. Also make scarves for abused women and hats for maritime sailors. So while crochet saved my life in one way, I now can’t pursue my hobby. Hope it gets better over time with the various remedies I am trying. I’m currently dealing with a bout of tenosynovitis. I had a C-section and two more abdominal surgeries and have never complained about the pain. This however, makes me want to cry. It has been months and will probably continue for months. Ouch! I had 2 c-sections, and pregnancy/hormones soften the soft tissues in your body. (muscles, tendons, ligaments) Go easy on the knitting and crocheting now, as you’ll probably only worsen the condition. It’s enough strain on you to just pick up the baby for now. Talk to your doc about getting an occupational therapy referral (I’m a retired OT) to evaluate you, if you haven’t done this already. You might benefit from a splint to protect you from more injury. Best wishes to you.